The Mangalitsa is a mixture of the primitive race of Mediterranean sumadia trunk ( to which also belongs to our Iberian pig), with half-savage races of the Carpathians, as szakonyl and bakonyl. Its breeding focuses in the region between the Danube and the Carpathians, which comprises the Hungarian steppe and a great plain with cold, snowy winters and hot dry summers. Perfect weather for a pig, that due to their genetic characteristics and the climate of the area, make it the pig breed with more fat than any breed. These features give character to meat, which is essential for the healing of ham and for its peculiar taste, that only gives the marbling fat. Mangalitsas were bred for their lard on the Hungarian farms of Archduke Joseph in the 1830s. Herds shrank with the collapse of the Austro-Hungarian Empire after World War I and declined further with the introduction of fast-growing white pigs and cheaper, higher quality vegetable oils after World War II. 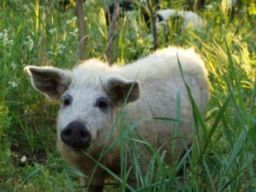 Since then the popularity as well as the population of Mangalitsa have been decreasing: the Mangalitsa produces too little lean meat so it has been gradually replaced by modern domestic breeds. But Peter Toth, a Hungarian animal genetist, did not want this Hapsburg legacy to be lost. “When Communism collapsed”, Mr. Toth said, “the state farms that served as the last gene banks also collapsed. It was a total anarchy in the country. When I started to save Mangalitsas, to search for them in 1991, I found only 198 purebred pigs in the country”. This breed is different in several aspects. Mangalitsas give birth to only 5 to 8 piglets instead of the 12 to 14 of more commonly raised breeds. Their feed is a mix of barley, wheat, wheat bran, alfalfa and sunflower seeds. Killing weight (for meat production) is generally achieved beyond 12 months of age at about 140 kilos (300 pounds) to make sure that the marbling is maximized and the meat the best quality. The carcass has only half of the quantity of meat and double the fat. Se. The primary product made from this pig is lard and sausage. The minced meat is seasoned with salt, pepper, sweet papikra and other spices. It is eaten in slices with pickled vegetables. Its pork is also served braised with potatoes and stuffed peppers. The Mangalitsa products, such as cured dried ham or fresh loin, are much more expensive than other commercial pig breeds.